This was back when panels and presentations were SRO. I forget the event but I arrived early to get a seat. A guy maybe ten years older sat down next to me. He asked what I collected. I gave my usual answer. No specialties. I just loved the medium and liked any comics that were interesting to me. Plastic Man, undergrounds, French albums, reprints of Captain Marvel. This guy started carping about “duck books” and their fans. He was referring to Carl Barks fans. “So, what is it you collect?” I asked. “Little Lulu.” Straight face. Not a trace of irony or defiance. 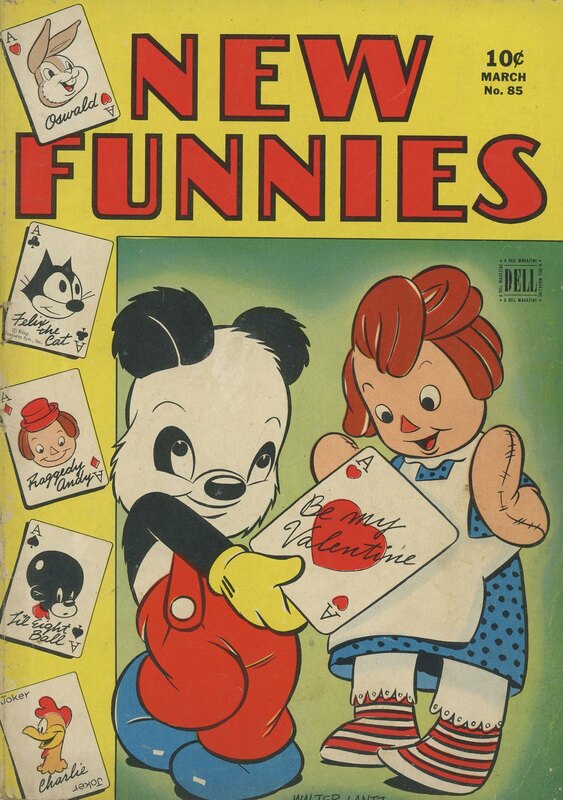 That’s the first I heard of anyone over ten years old reading Little Lulu comics. It made me curious enough to look into it. But where to begin? Well, that won’t be a problem for you, dear reader. 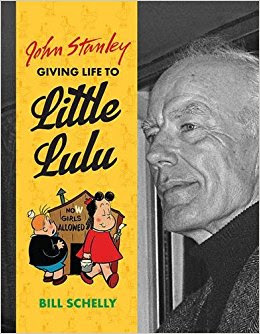 Because Bill Schelly has written one terrific book about the genius behind Little Lulu, Tubby, Alvin and many other comics that were touched by the particular talents of John Stanley. 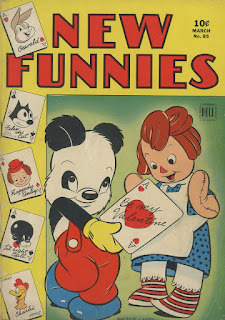 The book is John Stanley: Giving Life to Little Lulu and it is worth the time of anyone familiar with Stanley's work or curious about the history and creative process of making American comic books. 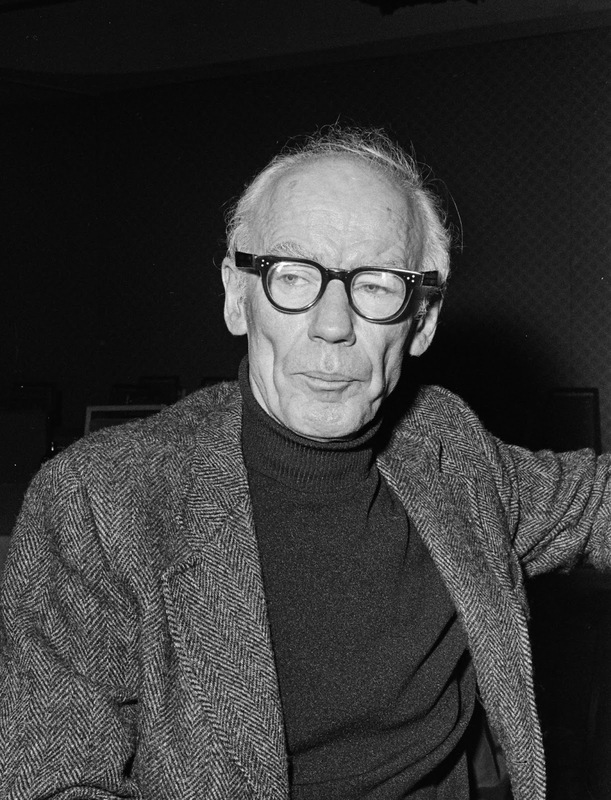 Not much is known of Stanley’s life and Schelly mines for every scrap of information from interviews with his children and former collaborators. 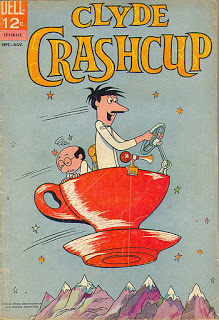 What comes to light is the story of a man with a restless imagination and grand sense of comedy who plied his trade mostly at Dell Comics for more than twenty years. In addition to Lulu he scripted Tom and Jerry, Andy Panda, Woody Woodpecker and lots of other licensed characters from animation. He also did a substantial run on a pair of characters dear to my heart; Raggedy Ann and Andy. 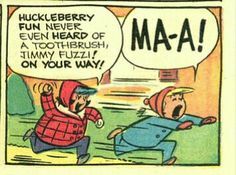 He would go on to long runs on Nancy and Sluggo and even create a number of his own titles like Dunc & Loo, O.G. Whiz, Linda Lark and Milton the Monster. 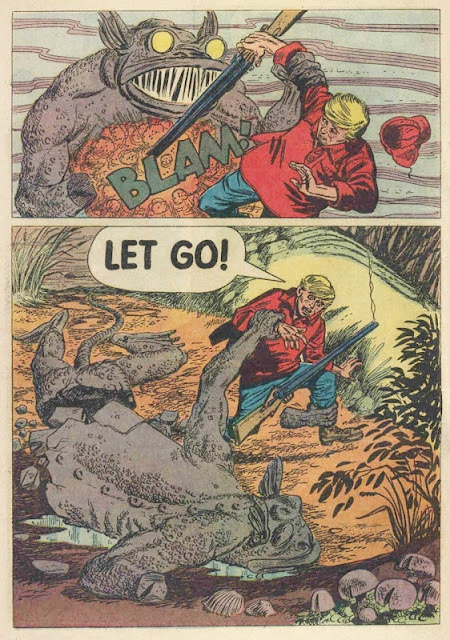 He’s the brain responsible behind the Dell Giant Tales from the Tomb, a righteously scary throwback to the kind of horror stories that nearly ended comics a decade before. Dell never subscribed to the Comics Code as they long had a code of their very own they faithfully subscribed to. This allowed them to present the kind of the book that caused the furor that ended EC Comics and nearly the entire industry in the USA. Stanley went for mood, weirdness and tension-cranking suspense rather than gross-out grue. It was still too close for comfort. 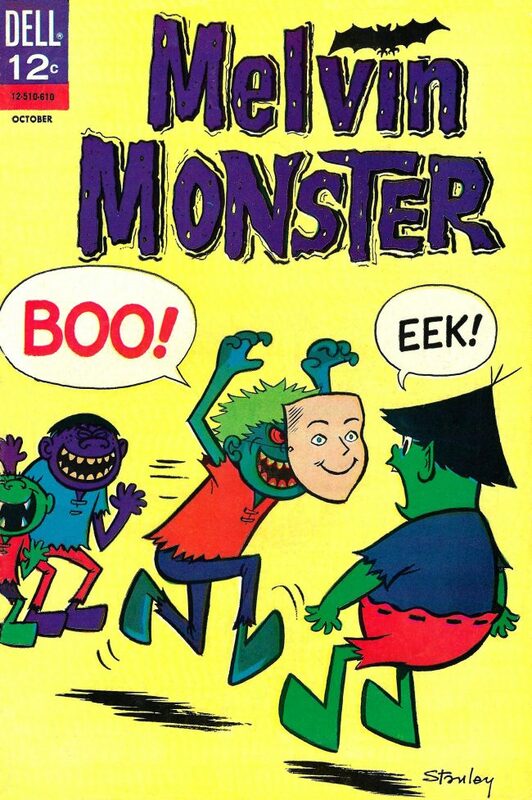 The book was one of Dell’s most successful titles ever showing that there was still a ready audience for horror in comics but it was never repeated due to angry reactions from parents, teachers and distributors. My favorite of his later creations is a comic called Thirteen, with the subtitle Going on Eighteen. These stories feature a pair of girls named Val and Judy and their adventures are amped up slapstick and farce as the friends experience crushes, rivalries, heartache and embarrassment in their adolescent years. 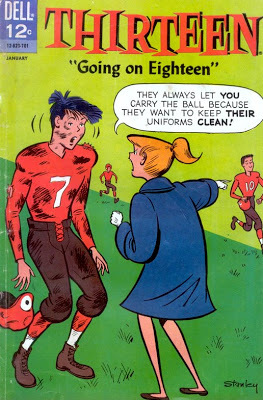 It’s Archie comics with hormones. Val is an irresistible force at once adorable and maddening and Stanley uses her as his muse for a portrayal of blissful youth as accurate as any I’ve seen. Mercurial and maddeningly fickle, Val is a blessing and a curse to Billy, the boy next door and the object of her affections. The byplay between them is sublime. Billy is one cool customer who stays ahead of Val’s near-constant mood shifts and, by doing so, driving her to more and more desperate measures for his attention. The plotlines are light as air with the consequences only of matter to the characters in the story. 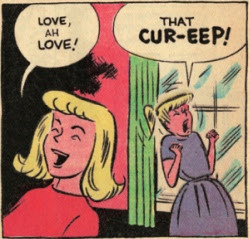 Part of the humor are Val and Judy overdramatizing the stakes risked by their various adventures. And the back-ups feature Judy Jr, a kind of sociopathic Little Lulu whose main reason for existence seems to be making life hell for neighbor boy Jimmy Fuzzi. The book delves into Stanley’s life and its highs and lows. Little tidbits fascinate such as the fact that Stanley and Jack Kirby were both in-betweeners at Fleischer Studios as the same time. And I finally have it confirmed that Walt Kelly was as much of a heel as I always suspected he was. There was a lot here for me, personally, to sympathize with. And even more I recognized. Stanley approached the work of scripting comics much as I do, thinking up the Big Scene or Big Idea and writing to set it up and pay it off; often having only the vaguest idea where he was going after Page One, Panel One. He also stayed on a title until the wheels came off, finding more and more inspiration as he invested himself into the characters and their environment deeper and deeper. A simply marvelous book that’s more than a biography. It’s an oversized book loaded with photos and examples of Stanley’s work including the few pieces he did for the New Yorker. Apparently, he also wrote gags for some of the country’s best known spot cartoonists. There’s also roughs (Stanley drew his scripts out as storyboards), sketches, caricatures and a few of the paintings commissioned by fans of Stanley’s later years when he finally began to get the recognition he deserved. And he deserves every bit of that. John Stanley was a true comics pioneer who, along with Carl Barks, created the comics scripting form. They invented comic book writing; bringing to it a craft and level of sophistication absent from almost all comics at the time. Stanley’s work reads as fresh today as when it was first published. There’s nothing quaint or kitschy about them. They don’t need the haze of nostalgia to make them enjoyable. You can’t say that about many seventy year old comic books. I love John Stanley's work from Lulu to Thirteen. I bought a collection of silver age DCs and Marvels for $100 about 1979 just before I went to the Kubert School. There was a handful of Lulus and Thirteens in it. I had no intention of reading what I considered little girl comics. I knew about Carl Barks but these weren't his ducks. Then I got sick with bronchitis while in Jersey and one day I dug them out. I couldn't believe how great they were. That started me on a collecting drive to get all the Thirteens and and many of the Lulus. I love them. I even managed to find a Thirtenn cover on eBay and buy it before anyone realized what it was.